Hacks/Hackers global coordinator and New York co-organiser Chrys Wu (@MacDiva on Twitter) spent an evening with Hacks/Hackers Brighton on Tuesday, 22 November to report on what chapters around the world have been doing. She explained Hacks/Hackers started just 18 months ago, with an idea originating in mid-2009. “Developers and journalists really do need each other,” Wu said, explaining how a variety of social meetups, talks, demo days and hackathons are the basis for the Hacks/Hackers community. The groups work to “improve the practice of journalism through tools and technologies”. She explained that there are now many chapters around the world, including about 20 in Africa, with one launching in Cairo soon. A group has also started in Yerevan, Armenia, and has announced a hackathon with help from Microsoft. And because “talking is good; making is better,” developers and journalists spend hack days together, such as at Hacks/Hackers Hacking, an event which took place at ONA11, the Online News Association conference held in Boston in September. The ONA11 hack day included a project where a team of about 10 hacks and hackers who took up a challenge to help NPR’s Andy Carvin work out how to visualise data from around 85,000 tweets. A journalist from La Nacion in Argentina also tasked a group with developing a way to process data from PDFs in order to better understand gas prices in the country. Chrys, a coder as well as a journalist, has spent time at The Los Angeles Times, where she worked on the Pulitzer prize-winning series, Altered Oceans, CBS and The Washington Post, having been recruited to help develop content distribution strategy. She works with Hacks/Hackers chapters worldwide to help them launch and sustain local communities interested in journalism and technology. Developer Laurian Gridinoc (@gridinoc on Twitter) is one of the first five winners of a Knight-Mozilla fellowship and will spend 10 months embedded within the BBC newsroom to generate ideas, train colleagues and bridge the gap between technology and the news. Laurian told Hacks/Hackers Brighton about the proposal that resulted in him securing a funded placement and discussed the types of projects he will be working on. He said there were around 300 ideas submitted, with 60 getting through to the first round. Twenty projects were invited to attend a learning lab in Berlin, and 11 finalists presented to news partners. Just five were selected to become Knight-Mozilla fellows, with one each at the BBC, Al Jazeera English, the Guardian, Zeit Online and the Boston Globe. Each news organisation had different aims and selected a hack/hacker with skills and ambitions that matched their plans. Gridinoc, who proposed a collaborative storyboarding tool, will be “trying to enhance storytelling”, particularly in online video. He will be addressing problems with Adobe Flash and will expanding possibilities by constantly asking the question “what if”: “What if there weren’t the constraints of time? What if there weren’t any constrains on platforms?” he said. He will then use open source assets to create his own code, templates and prototypes, spending a maximum of two weeks on a project. Laurian also shared his interesting career path. While studying medicine he co-founded a brand strategy and interactive consultancy in Romania. He then followed his interest in the semantic web through a masters in computational linguistics and research into semantic navigation at Knowledge Media Institute (Open University). For the past year he has been based in Birmingham, implementing applications using semantic web technologies at the technology innovation company Talis. This is cross-posted on the Hacks/Hackers blog. This entry was posted in Events and tagged #hhbtn, Chrys Wu, hacks and hackers, Hacks/Hackers Brighton, knight-mozilla, Laurian Gridinoc on November 29, 2011 by Sarah Marshall. Reed Business Information (RBI) is hosting an event for journalists and programmers interested in working together on data visualisation. The one-day “hack day”, which will take place on 29 November, will be run with the help of data scraping project ScraperWiki. It’s a hot topic for all journalists, but it’s particularly relevant in the B2B sector. B2B journalism is focused on delivering information that it’s audience can act on, supporting important business decisions. Often a well-thought-out visualisation of data can be the most effective way of delivering critical information and helping users to understand key trends. We’re already having some successes with this kind of journalism, and we think we can do a lot more. So building up the skills of our editorial teams in this area is very important. You can register for the event at this link. This entry was posted in Events and tagged data, Data journalism, Events, hacks and hackers, RBI, Reed Business Information, scraperwiki on October 20, 2010 by Laura Oliver. The Online Journalism Review’s Robert Hernandez has posted an interesting interview with Burt Herman, former Associated Press bureau chief, CEO of new startup Storify and founder of Hacks/Hackers. Herman gives a great insight into his journey from journalist to CEO, as well as the story behind his founding of the popular Hacks/Hackers event which recently started running meetings in the UK. The first big difference is that being a journalist gives you a daily sense of accomplishing something by writing a story and having it be published. You then move on to the next story and get constant feedback. Trying to create a business and develop internet applications is a much longer process, filled with many ups and downs along the way. It’s exciting to be your own boss but also can be terrifying at the same time. I suppose dropping into crisis zones and new countries was a decent preparation for this, and also just being open to always learning new things. Storify curates selected photos, videos, tweets and other notes by search, which can then be published as embeddable stories made up of original sources. Here is a demo of Storify from Burt Herman posted on Vimeo. This entry was posted in Business, Editors' pick, Handy tools and technology, Online Journalism, Social media and blogging and tagged Burt Herman, Business, hacks and hackers, Online Journalism, Online Journalism Review on October 11, 2010 by Rachel Bartlett. Can hacks and hackers work together in the new online news world? This is the question posed by Open Journalism And The Open Web, a free online course being run by the online educational community site p2pu.org in conjunction with Hacks/Hackers, the Mozilla Foundation, the Medill School Of Journalism and the Media Consortium. The course’s aim is to bring developers, journalists and those relatively uncommon people with a foot in both camps together to answer that question. As I posted here back in May, I was involved in the early Ruby In The Pub meetings, which have now evolved into the UK arm of Hacks/Hackers. The last meeting attracted over 50 people with talks from a representative of Google as well as hacks and hackers from The Times. It’s a testament to the power of collaboration and the seeking spirit of those that find themselves in this digital space. So when I discovered this experimental course I jumped at the chance to apply, and to my delight was accepted along with forty other people. Like many such initiatives the course is being run freestyle, with input from attendees welcomed and collaboration positively encouraged. There’s even homework. The course is now in it’s third week and so far the lectures have been excellent – lecture 2 included a talk from Burt Herman, co-creator of Hacks/Hackers and the man behind storify.com. We’ve also had a lecture from Rob Purdie, agile development experty of the Economist and subjects and questions that have come up so far have involved the nature of collaboration, how to break down technical projects into smaller components and story analysis. The discourse has been vibrant and engaging and I’m sure interesting projects will emerge. More importantly, this is a living experiment, an embodiment of the questions posed by Hacks/Hackers and their ilk in a more structured format. When the six-week time capsule comes to an end, I’m sure I will have learned a lot about journalism and journalists, the problems they face and their perception of data and information systems. I hope they will feel the same about developers. Interestingly, the first barrier we came up against was, not surprisingly, language. This hit home with the more technical assignments and discussions, where a lot of us hackers went straight into jargon mode. We require a compressed and succint language as our job is fast-paced and we need to communicate quickly. It serves as shorthand. But, like developers who spend a lot of time talking to the non-technical side of their business, we soon realised that we had some hacks amongst us too and needed to dilute the language a little in order to bridge the gap and freely explore our common interests and problems. So far that commonality – engagement and curiousity, the desire to stay one step ahead in fast-changing digital arena, a passion for information – seem to be outweighing the differences. Three weeks to go. I’ll try and drop a post once a week with an update on what’s happening and hopefully will be able to interview the P2PU guys at the end. It’s an exciting time to be a hack and a hacker. This entry was posted in Data, Online Journalism and tagged Data journalism, dave goodchild, hacking, hacks and hackers, p2p on October 7, 2010 by Dave Goodchild. 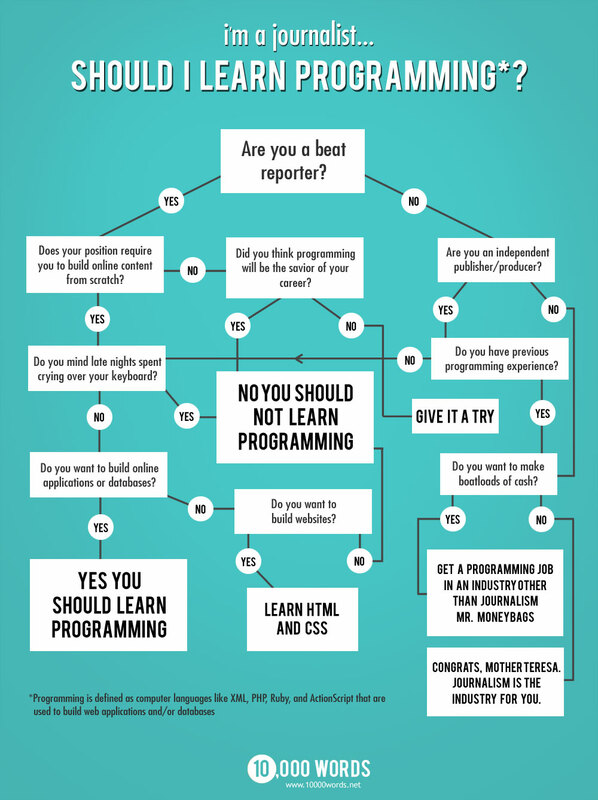 I’m a journalist – should I learn programming? Many reporters are starting to move on from the world of HTML or CSS coding and getting to grips with more technical programming knowledge. But web development isn’t for everyone, so how do you know if it will be right for you? Using some trusty know-how and specially selected questions, digital journalist Mark Luckie has tried to help reporters answer that very question. His flowchart, shown below, is hosted on his 10,000 words blog. This entry was posted in Data, Editors' pick, Online Journalism and tagged digital journalism, hacks and hackers, mark luckie, programming on July 21, 2010 by Rachel Bartlett. As we reported earlier this week, journalists and programmers got together last Friday in London to produce some fantastically inspirational projects. ScraperWiki (behind a new data tool soon to launch in beta) has now published its report of the day, explaining each of the projects. With a little more work, these projects could make excellent news stories. Developer Edmund van der Burg, freelance journalist Anne Marie Cumiskey, Charlie Duff from HRzone.co.uk, Ian McDonald of the BBC and Dafydd Vaughn munged a whole host of datasets together to produce an analysis of the new Conservative candidates in the 12 safest Tory seats in Britain. Their conclusions: British white and male, average age 53, Oxford-educated, rarely on Facebook or Twitter. Gavin Sheridan from TheStory.ie and Duncan Parkes of mySociety used ScraperWiki to combine a list of grants made by Enterprise Ireland (which Gavin had aquired via an FOI request) with the profile data listed on the Enterprise Ireland website. This will no doubt be a source for stories in the near future. This entry was posted in Editors' pick, Events, Handy tools and technology and tagged conservative safe seats, enterprise ireland, hacks and hackers, scraperwiki on February 5, 2010 by Judith Townend.